This 2 mil vinyl film has a specially formulated adhesive that neither lifts the surface nor strips off work already completed. 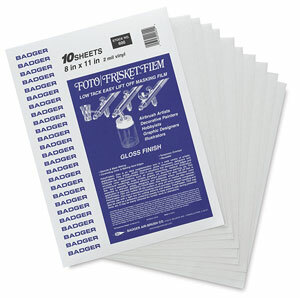 Film is transparent, low tack, and easy to lift. Badger Film leaves no residue after removal. This clear film can also be used as a temporary protective overlay. A translucent backing provides for easier handling and permits use with a light box for cutting stencils and masks. ® Badger is a registered trademark.™ Foto/Frisket is a trademark.